Electric Guitar Modifications and Hot Rods!!!! Okay, so your guitar is working fine, why not make it cool with some new pickups or wiring modifications? Customize your guitar to better fit your needs. I can add switches or push/pull pots to add and combine tones, some wiring mods require no modification to the body at all. My favorite modifications are listed below. If you're looking for something not listed, let me know. I will be glad to help. This is one of my favorites, on a regular Strat set up you are missing out on the Neck+ Bridge pickups together, by adding a toggle switch or a push/pull knob you can turn on the bridge pick up and add it to any switch position. Some very cool sounds come along with this one! I do this one alot, in fact I have my Strat wired like this and I love it, instead of adding a switch to add the bridge pickup, I rewire the bottom tone knob to the Neck+Bridge pickups and use it as a blender knob. This gives you a Strat with 1 master volume, 1 master tone and the bottom knob blends the bridge pickup into position 1+2 and the neck pickup into position 4+5. A very cool set up with no physical alteration to the body and no added switches. A push/pull knob to reverse phase the bridge pickup is way cool with The 7 Sound Strat!!!!! 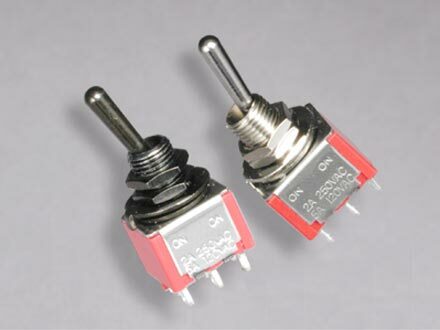 ​ Mini switches and push/pull pots basically do the same thing, the difference is that a small hole will have to be drilled to accommodate the new switch, while a push/pull pot will just replace the existing tone or volume control. There are plus and minuses to both and in the end its a matter of personal preference.Some players find the mini switches in the way and others don't like to mess with the knobs unless they're turning it up or down. However both ways have their uses. Most commonly they are used to cut a Humbucker to a single coil and back, or to put two pickups out of phase with each other for a cool "quacky" sound, or to switch two pickups from parallel to series wiring for a fuller sound. 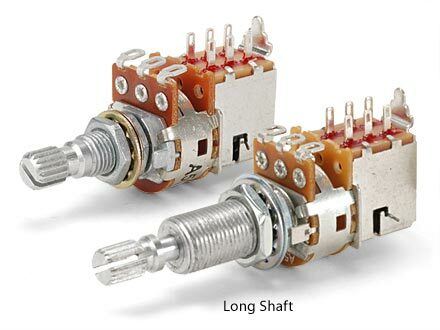 Many people add a switch to turn on the neck or bridge pickup in any switch position, this along with a phase switch gives lots of cool tonal possibilties. The PA2 boosts your output up to 20db's to overdrive your amp at the flick of a switch. 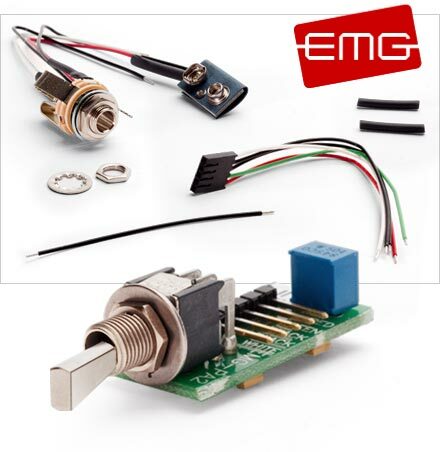 The EMG Afterburner is a push/pull option, pull the knob up to turn it on and dial it in and out for distortion or a cleaner sound. I have completely replaced the tone knob with this piece for a few players. 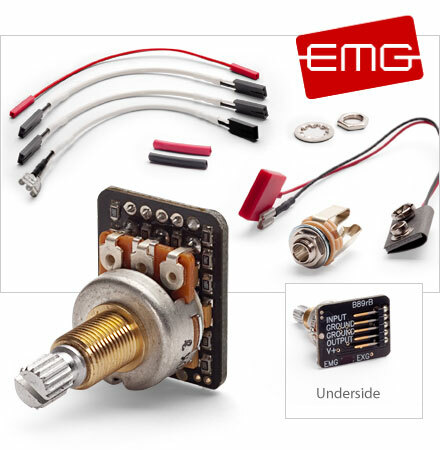 The EMG EXG Guitar Expander simultaneously boosts your guitar's highs and lows while decreasing the midrange, for clear, clean, non-muddy tone that stands out in a mix. 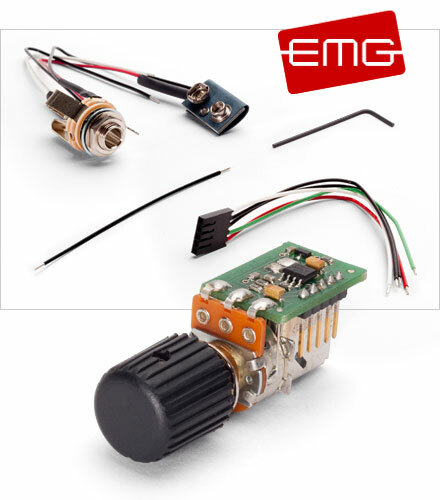 The active EXG control dials it in right on your guitar, without external EQ, effects boxes or pedals. 3) the ability to put the neck pickup out of phase with the bridge pickup (phasing other combinations results in a rather thin tone that many players don't care for). Selecting the neck and bridge together gives a tone that is similar to the Tele "twang" of neck and bridge. 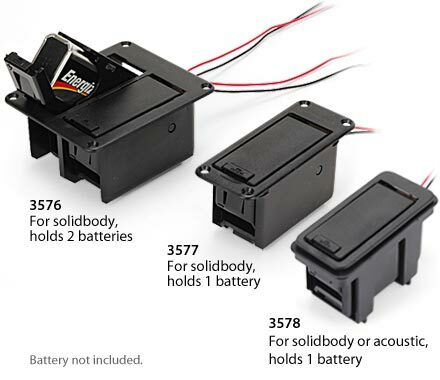 Wiring the pickups in series gives a noticeably hotter output that is great for pushing an amp into distortion without using pedals. The tone also changes a little but that change is less easy to describe. Selecting the neck and bridge pickups out of phase gives an interesting tone that again is difficult to describe. It's just different, and quite useful. With hot pickups the tone might be described as "hollow," especially on the lower strings. The results in this position also vary quite widely with the pickups chosen and the construction (i.e. Tele, vs. Strat vs. something else). This modification uses two push/pull switches (one on the volume pot, one on the neck tone pot) to achieve the above switching.